SDCC 2015: First look at Storm in X-men Apocalypse! SDCC 2015 is shaping up to be awesome for Black Hero fans and now we can share this image of Apocalypse and Storm from the upcoming Bryan Singer directed X-men Apocalypse! Storm is portrayed by Alexandra Shipp,and Oscar Isaac as Apocalypse. In the full trailer by the way, Storm looks awesome, like a perfect realization of the mid ’80s white-mohawked goddess. And as we see…she’s with Apocalypse! Update 13/7/2015 More shots of Storm from the trailer! Update 15/7/2015 Official photos released! Storm, Magneto, Archangel, Psylocke and an unidentified mutant are clearly under the thrall of Apocalypse and will be used as his strike force while battling the young X-men. Interesting times ahead! “X-Men: Apocalypse” launches in theaters May 27, 2016. Are you excited about X-men: Apocalypse? SDCC 2015: The Return of Blade…and his daughter?! SDCC 2015: The Return of Milestone Media llc. Me and you both JJ! These characters have to treated perceptively, and with respect and with an understanding of who they are and what they stand for . Same here! 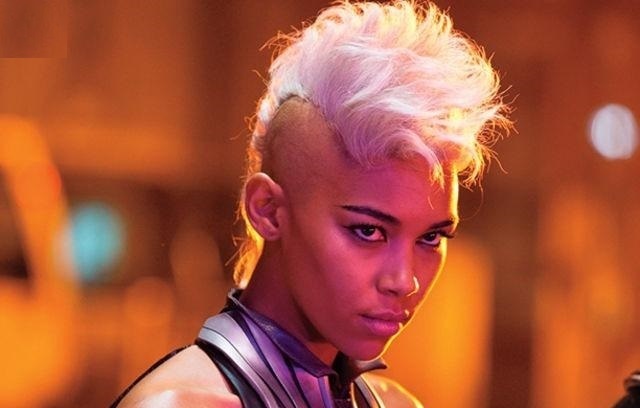 At first l doubted Alexandra Shipp as Storm, but l must admit, she has Storm’s look down. l just hope she can deliver the role as Storm, b/c her portrayal as Aaliyah was horrible. Apocalypse looks sad & worn out. WTH! He’s supposed to look threatening. Gulp…I guess I will be eating my previous posts about Ms. Shipp’s portrayal…I am impressed with the likeness from the comic book version. Still will reserve further judgment until the movie comes out but I have to say I am impressed (so far)..